I've got myself a new mobile phone - a Nokia N8 in metallic mint-bug green. Apple fanbeings will be rolling their eyes at something so antiquated as a Symbian phone, and devotees of Android will similarly be cocking snooks, but I happen to like it. 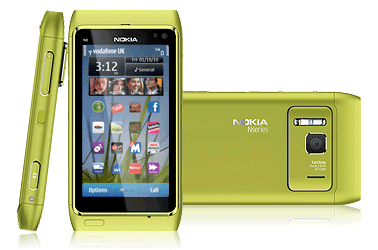 No doubt it will be the last high-end Symbian phone Nokia make, what with their new capitulation^W partnership with Microsoft. The headline stuff is the 12 MP camera and HD video, but for me the appeal was simply that it was like my old 5800 but better. Threaded messages (at last): tick. Reliable PDF reader: tick. The whole interface works in both landscape and portrait mode: tick. (Eat that, iPhone.) Sure, there are irritations, and the number of apps available is woeful, but on balance I'm a rather happy bunny. 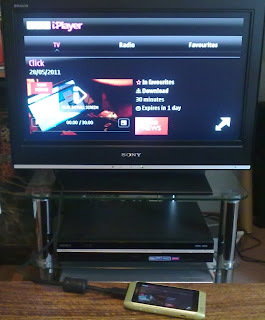 Standout features that I hadn't even thought about in my decision include the FM transmitter (so I can broadcast podcasts to the car radio) and the HDMI output, so I can connect to the net over the Wi-Fi network and watch iPlayer and other streamed video on the TV (see photo). Small pleasures. And yes, I've named mine after a rodent, as usual.